Guar gum is a type of dietary fiber extracted from the seed of the guar plant. Used as a food additive to improve flavor and texture, guar gum can be found in yogurts, soup, fiber supplements and personal care products. It’s often a staple ingredient in all-natural, non-GMO products. With eight times the thickening potency as cornstarch, guar gum holds up well to freezing, thawing and heat. Low in calories and high in fiber, it can help you stay fuller for longer, meaning it may aid in weight loss and weight management. It may also promote glucose absorption, which normalizes blood sugar, decreasing the risk of diabetes and heart disease. Thanks to its high fiber content, guar gum could help treat a wide range of digestive issues. Studies suggest it acts as a laxative, relieving chronic constipation and improving bowel movement frequency by bulking up stool (x). Guar gum can also relieve symptoms of irritable bowel syndrome (IBS), including bloating, diarrhea, constipation, pain and cramping (x). It may further benefit your intestinal health by supporting the growth of healthy gut bacteria and preventing the growth of harmful gut bacteria (x). 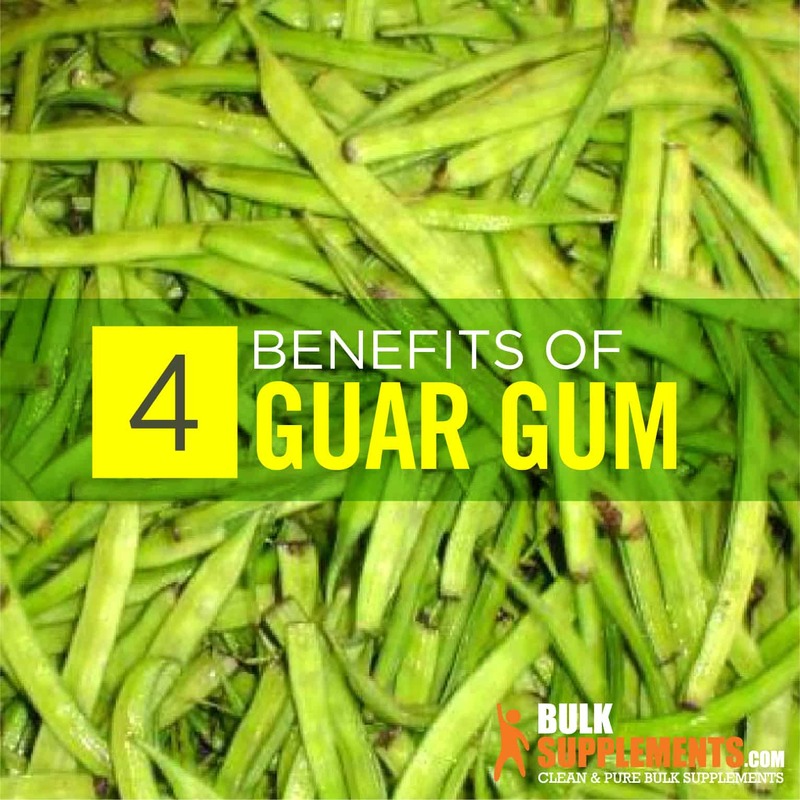 Guar gum benefits your heart health by lowering blood sugar and cholesterol levels. As a type of soluble fiber, it naturally slows down sugar absorption in your bloodstream. For people with diabetes, this could be potentially very helpful; studies suggest that guar gum could help manage blood sugar (x). In addition to lowering blood sugar levels, guar gum may also lower blood cholesterol. This is because the fibers in the guar gum consume the acids circulating throughout your body. Your liver needs cholesterol to create more acid, keeping everything balanced. 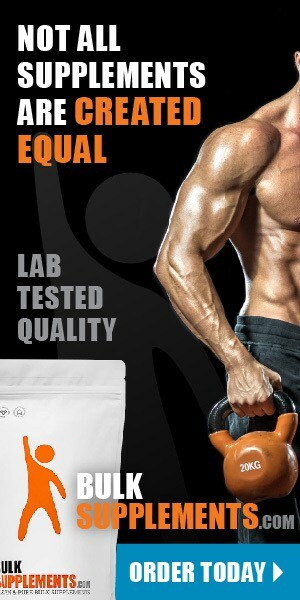 Guar gum supplements may lower both total and LDL cholesterol levels when taken consistently (x). Guar gum could promote weight loss because it naturally suppresses your appetite by making you feel full (x). Fiber in general is very effective for increasing feelings of satiation, which makes you less likely to snack throughout the day. Snacking on unhealthy foods is a huge factor in weight gain, because it ups your calorie intake and your body doesn’t necessarily have a way to burn off the calories. But if you take a guar gum supplement, it could curb your appetite before you overeat. Not all brands use guar or vegetable gum, so be sure to check the ingredients list before you purchase a product. As a vegetable-based thickening agent, guar gum is a vegan, vegetarian and gluten-free alternative to wheat and traditional flour. It will give any sorbet a smooth and creamy texture, and can be added as an egg substitute to gluten-free and vegan baked goods like muffins, bread and pizza. As long as you adhere to the recommended dosage, guar gum is safe to take for healthy adults. Since it causes you to feel full, guar gum may cause bloating and excess gas; over time, your body will adjust to these side effects. If taken in excess amounts, guar gum may swell and cause a blockage in the throat–do not exceed the recommended dosage. An allergy to guar gum can be can be very dangerous. To ensure that you are not allergic to it, take it in very small doses before taking the recommended dosage. People who are allergic to soy or have soy sensitivities are more likely to have an adverse reaction to guar gum because it contains similar proteins that could irritate your digestive system. As a dietary supplement, take 1.5 grams (just under 1/2 tsp) up to three times daily. Mix the powder into water and drink approximately 30 minutes before a meal. Because guar gum is a thickening agent, it can cause the water to reach a gel-like state if it is not consumed shortly after it is mixed. Do not consume guar gum once it thickens into a gel, as it may continue to thicken and get stuck in the throat, creating a breathing or choking hazard. If you struggle with constipation, IBS or other digestive problems, guar gum could relieve digestive symptoms and promote gut health. It may also benefit your heart health by regulating cholesterol and blood sugar levels. A vegan, vegetarian and gluten-free ingredient, it’s a gut-friendly alternative to traditional wheat and flour.